"iLevel allows me to assist customers, giving them the best possible shopping experience while having eye-to-eye contact." 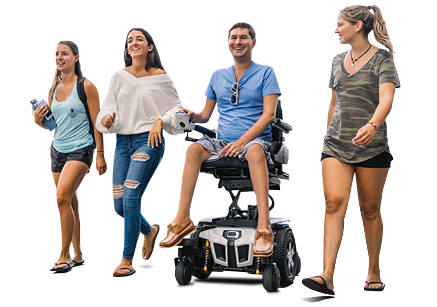 With his iLevel® Power Chair, Doug Allan enjoys working in the fast-paced retail world where he can experience eye-to-eye conversations with co-workers and customers. 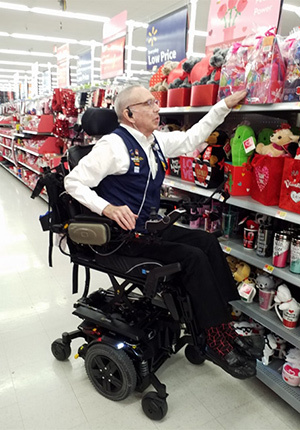 With his Q6 Edge® 2.0 with iLevel®, Doug Allan provides exceptional customer service in his job at Walmart. Doug has worked for the company for 14 years, enjoying the fast-paced retail industry. In his current position at the store in McMinnville, Oregon, iLevel technology enhances Doug’s work performance. In addition to his cool socks, the “Night Train” shroud on Doug’s power chair allows him to work in style. Doug is grateful that the company has created a stronger team of employees by having an environment of diversity for both associates and customers. “Thanks to my new iLevel, there is a new level of inclusion with both my customers and co-workers,” Doug said.